These situations are varied based on specific router types and brands. For more information on how your specific router broadcasts its Wi-Fi frequencies, please refer to the router's manufacturer for additional assistance. Most Wi-Fi routers automatically choose the Wi-Fi band that provides the best Wi-Fi signal to the mobile device. They use the same SSID for both the 2.4GHz and 5GHz band networks. This means the router uses both frequency bands but, while both bands can be used, your mobile device will only connect to one band at any given time. Mobile devices that support only the 2.4GHz bands, such as older phones, will automatically connect to that band. Conversely, most dual band devices that support both 2.4GHz and 5GHz will automatically choose a band based on different factors like signal strength. Please note that every device is different and has its own rules which factor in signal strength, congestion, etc. to select the best band. Ultimately, your device will decide which band it will use to connect. To verify your mobile device is set to a 2.4GHz Wi-Fi network, navigate to the Settings menu and click on Wi-Fi. In this menu you will see all detectable networks in your area. Locate the SSID for your network, the SSID should be denoted by either a 2G (2.4) or 5G (5) end notation. 2G represents 2.4GHz and 5G represents a 5GHz band. Tap on the SSID with the 2G or 2.4 end notation and connect to that network using the Wi-Fi password associated with your network. Note: If you are having trouble finding out if you are on a 2.4GHz WiFi network, it will be necessary to obtain the information via your router. For more information on this process, please consult your specific router’s manufacturer or user manual for more details. 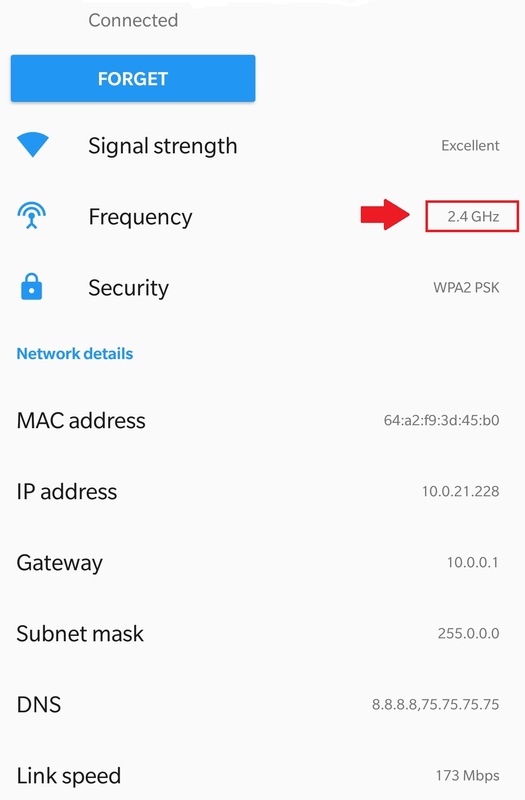 Verify your mobile device is connected to a 2.4GHz WiFi network. To connect to a 2.4GHz network, go to Settings ( )>Wi-Fi. In this menu you will see all detectable networks in your area. Locate the SSID for your network, and tap on the SSID with the 2G or 2.4 end notation. Connect to that network using the Wi-Fi password associated with your network. Your mobile device will then connect to that network, once it is connected you can continue setting up your device. For more information on how to set up your Amcrest camera on your mobile device, click here. Why Do I Have To Accept Location Permissions?